Decathlon Rockrider 5.2 , 5.3 derailleur hanger 6061 T651, made with CNC technology. Black anodized. Lighter and more durable than the hanger series. 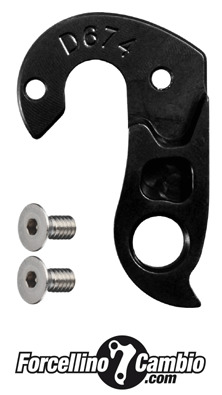 Decathlon RR 9.2 2007 derailleur hanger 6061 T651, made with CNC technology. Black anodized. Lighter and more durable than the hanger series. Decathlon various models derailleur hanger 6061 T651, made with CNC technology. Black anodized. Lighter and more durable than the hanger series. Rockrider 500S derailleur hanger 6061 T651, made with CNC technology. Black anodized. Lighter and more durable than the hanger series. Decathlon Rockrider 8.1/8.2/9.1/9.2 derailleur hanger 6061 T651, more durable than the hanger series. Derailleur Hanger Decathlon Triban 7 Trail in actual size 1:1 scale. various models Decathlon derailleur hanger 6061 T651, made with CNC technology. Black anodized. Lighter and more durable than the hanger series.